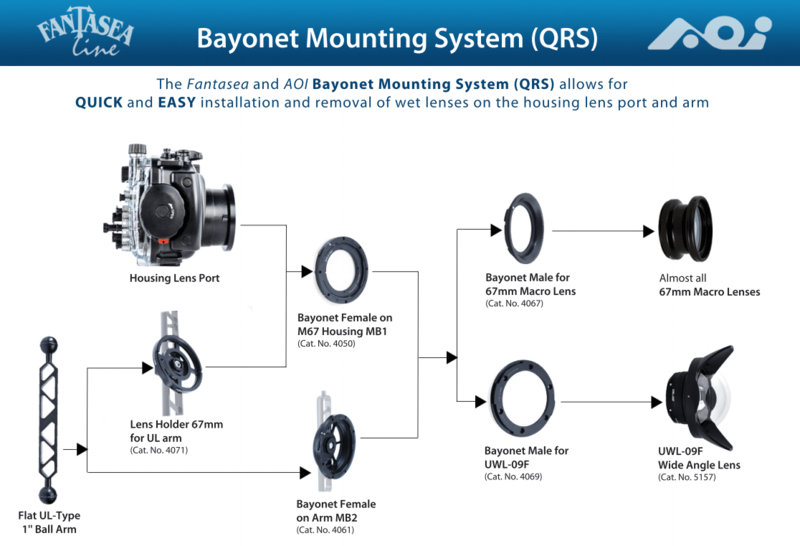 Fantasea and AOI recently introduced the Bayonet Mounting System, which allows for quick and easy quarter-turn installation and removal of wet lenses on underwater cameras’ housing lens port and arm. The male and/or female Bayonets attach to almost any flat housing lens port or lens holder featuring a 67mm (2.6-inch) thread. This allows for easily installing and removing wet lenses from the housing lens port or lens holder with a quarter turn. You can also get lens holders for securing accessory lenses when they are not in use. The Bayonets retail between US$60/~51.90 Euros and $120/103.81 Euros. For more info, check out the Fantasea website at fantasea.com.